From 08 mar 2019 to 11 mar 2019 played 9 games. 1 matches ended with a draw. The most goals 6 was in game (Bayern Munich - Wolfsburg, Werder Bremen - Schalke 04). Total goals in this round: 31 goals, in the previous round was 32 goals. A total crowd attendance of 395694 spectators. In previous round 373506. For Werder Bremen only in 1. Bundesliga the most goals scored: Max Kruse 6 goals, Milot Rashica 6 goals. Team the most matches played with formation: 4-3-3. Werder Bremen at home won 5 matches, 5 draws and 3 defeits. 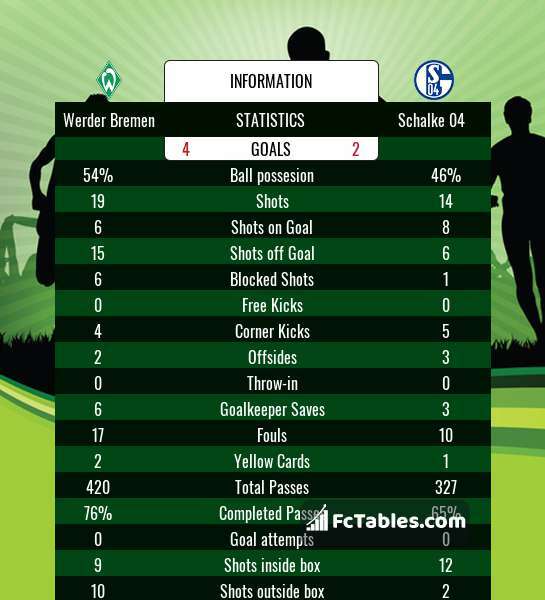 Werder Bremen scored average of 1.72 goals per game. In matches played at home 2.00 goals per game. In matches played at home an average of 3.62 goals (with opponent goals). For Schalke 04 only in 1. Bundesliga the most goals scored: Daniel Caligiuri 4 goals, Breel Embolo 4 goals. Team the most matches played with formation: 4-3-3. 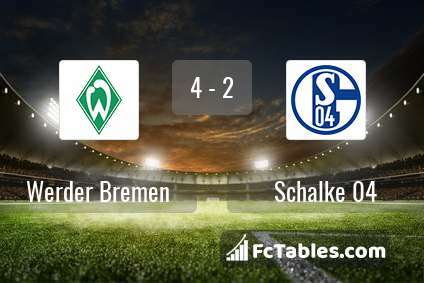 Schalke 04 away won 2 matches, 4 draws and 7 defeits. Schalke 04 scored average of 1.08 goals per game. In matches played away 1.08 goals per game. In matches played away an average of 2.85 goals (with opponent goals). Before the game team Werder Bremen in table was 9, Schalke 04 was: 14. The match ended with the result 4:2. For Bayern Munich only in 1. Bundesliga the most goals scored: Robert Lewandowski 17 goals, Serge Gnabry 7 goals. Team the most matches played with formation: 4-3-3. Bayern Munich at home won 8 matches, 3 draws and 1 defeits. Bayern Munich scored average of 2.48 goals per game. In matches played at home 2.42 goals per game. In matches played at home an average of 3.42 goals (with opponent goals). For Wolfsburg only in 1. Bundesliga the most goals scored: Wouter Weghorst 9 goals, Admir Mehmedi 5 goals. Team the most matches played with formation: 4-3-3. Wolfsburg away won 7 matches, 2 draws and 4 defeits. 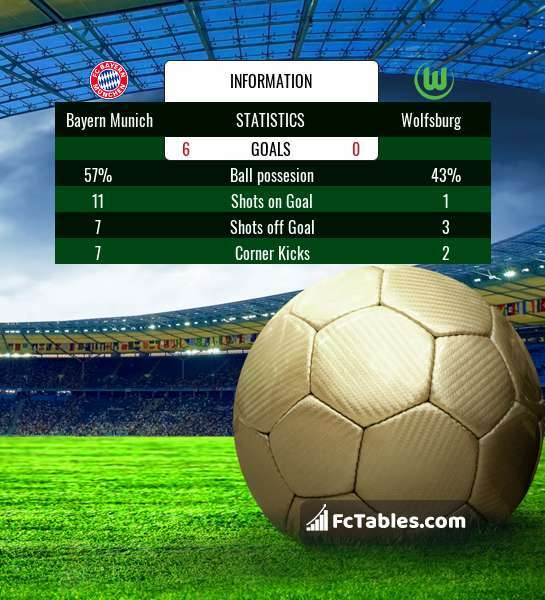 Wolfsburg scored average of 1.56 goals per game. In matches played away 1.69 goals per game. In matches played away an average of 3.15 goals (with opponent goals). 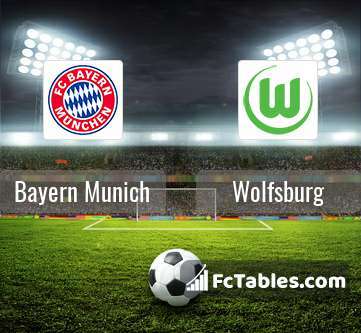 Before the game team Bayern Munich in table was 1, Wolfsburg was: 7. The match ended with the result 6:0. For Borussia Dortmund only in 1. Bundesliga the most goals scored: Marco Reus 14 goals, Francisco Alcacer 14 goals. Team the most matches played with formation: 4-2-3-1. Borussia Dortmund at home won 11 matches, 2 draws and 0 defeits. 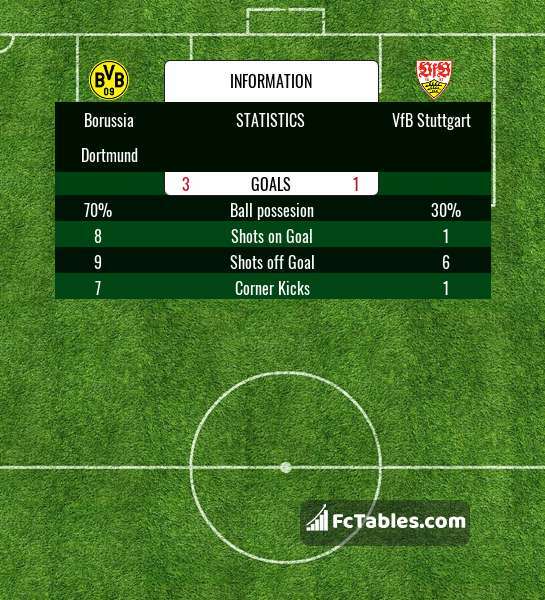 Borussia Dortmund scored average of 2.44 goals per game. In matches played at home 3.31 goals per game. In matches played at home an average of 4.69 goals (with opponent goals). For VfB Stuttgart only in 1. Bundesliga the most goals scored: Mario Gomez 6 goals, Steven Zuber 4 goals. Team the most matches played with formation: 4-2-3-1. VfB Stuttgart away won 1 matches, 2 draws and 10 defeits. VfB Stuttgart scored average of 1.00 goals per game. In matches played away 0.69 goals per game. In matches played away an average of 3.08 goals (with opponent goals). 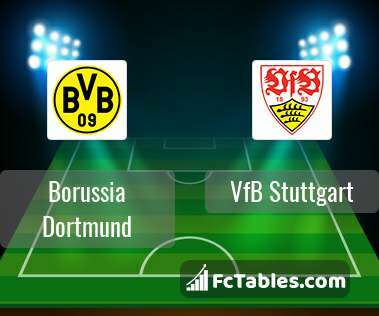 Before the game team Borussia Dortmund in table was 2, VfB Stuttgart was: 16. The match ended with the result 3:1. For RasenBallsport Leipzig only in 1. Bundesliga the most goals scored: Yussuf Poulsen 12 goals, Timo Werner 11 goals. Team the most matches played with formation: 4-3-3. RasenBallsport Leipzig at home won 7 matches, 5 draws and 1 defeits. RasenBallsport Leipzig scored average of 1.72 goals per game. In matches played at home 1.92 goals per game. In matches played at home an average of 2.54 goals (with opponent goals). For Augsburg only in 1. Bundesliga the most goals scored: Alfred Finnbogason 10 goals, Dong-Won Ji 4 goals. Team the most matches played with formation: 4-2-3-1. Augsburg away won 2 matches, 3 draws and 8 defeits. Augsburg scored average of 1.36 goals per game. In matches played away 1.00 goals per game. In matches played away an average of 3.00 goals (with opponent goals). Before the game team RasenBallsport Leipzig in table was 3, Augsburg was: 15. The match ended with the result 0:0. For Freiburg only in 1. Bundesliga the most goals scored: Nils Petersen 8 goals, Gian-Luca Waldschmidt 7 goals. Team the most matches played with formation: 4-4-2. Freiburg at home won 5 matches, 5 draws and 3 defeits. Freiburg scored average of 1.44 goals per game. In matches played at home 1.92 goals per game. In matches played at home an average of 3.46 goals (with opponent goals). For Hertha Berlin only in 1. Bundesliga the most goals scored: Ondrej Duda 10 goals, Vedad Ibisevic 9 goals. Team the most matches played with formation: 4-2-3-1. Hertha Berlin away won 4 matches, 3 draws and 6 defeits. Hertha Berlin scored average of 1.52 goals per game. In matches played away 1.46 goals per game. In matches played away an average of 3.00 goals (with opponent goals). Before the game team Freiburg in table was 12, Hertha Berlin was: 10. The match ended with the result 2:1. For FSV Mainz only in 1. Bundesliga the most goals scored: Jean-Philippe Mateta 7 goals, Robin Quaison 5 goals. Team the most matches played with formation: 4-3-3. FSV Mainz at home won 5 matches, 4 draws and 4 defeits. FSV Mainz scored average of 1.08 goals per game. In matches played at home 1.23 goals per game. In matches played at home an average of 2.46 goals (with opponent goals). For Borussia Moenchengladbach only in 1. Bundesliga the most goals scored: Alassane Plea 10 goals, Thorgan Hazard 9 goals. Team the most matches played with formation: 4-3-3. Borussia Moenchengladbach away won 5 matches, 4 draws and 4 defeits. Borussia Moenchengladbach scored average of 1.76 goals per game. In matches played away 1.38 goals per game. In matches played away an average of 2.62 goals (with opponent goals). 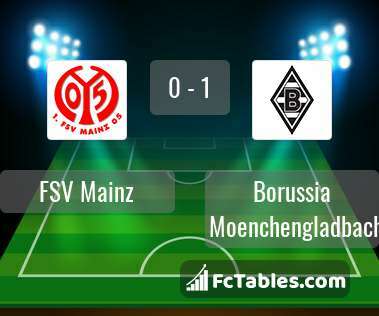 Before the game team FSV Mainz in table was 13, Borussia Moenchengladbach was: 4. The match ended with the result 0:1. For Hoffenheim only in 1. Bundesliga the most goals scored: Andrej Kramaric 12 goals, Ishak Belfodil 8 goals. Team the most matches played with formation: 3-5-2. Hoffenheim at home won 5 matches, 5 draws and 3 defeits. Hoffenheim scored average of 1.96 goals per game. In matches played at home 1.62 goals per game. In matches played at home an average of 2.69 goals (with opponent goals). For Nuernberg only in 1. Bundesliga the most goals scored: Hanno Behrens 4 goals, Mikael Ishak 3 goals. Team the most matches played with formation: 4-1-4-1. 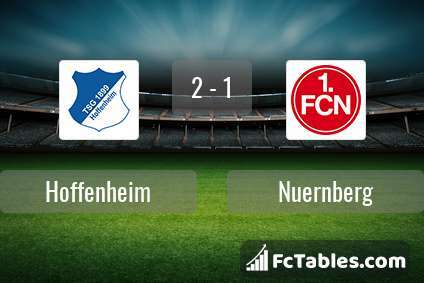 Nuernberg away won 0 matches, 2 draws and 10 defeits. 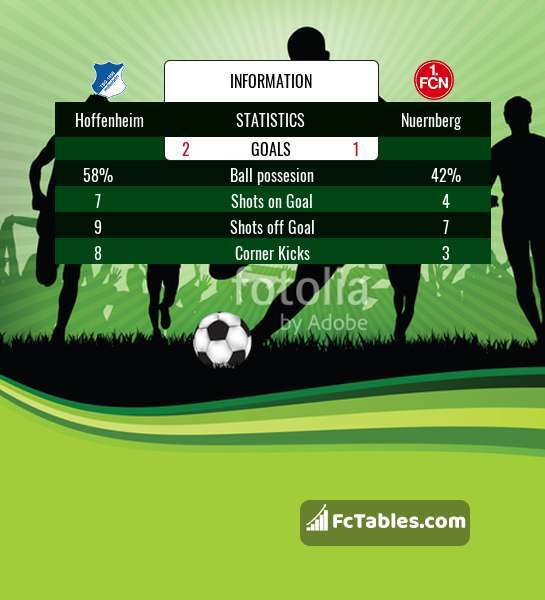 Nuernberg scored average of 0.76 goals per game. In matches played away 0.67 goals per game. In matches played away an average of 3.58 goals (with opponent goals). 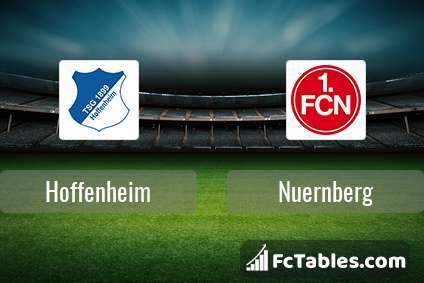 Before the game team Hoffenheim in table was 8, Nuernberg was: 18. The match ended with the result 2:1. For Hannover 96 only in 1. Bundesliga the most goals scored: Ihlas Bebou 3 goals, Bobby Shou Wood 3 goals. Team the most matches played with formation: 3-4-1-2. 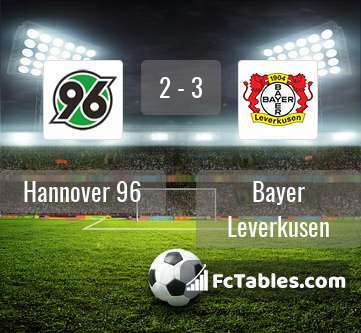 Hannover 96 at home won 3 matches, 1 draws and 9 defeits. 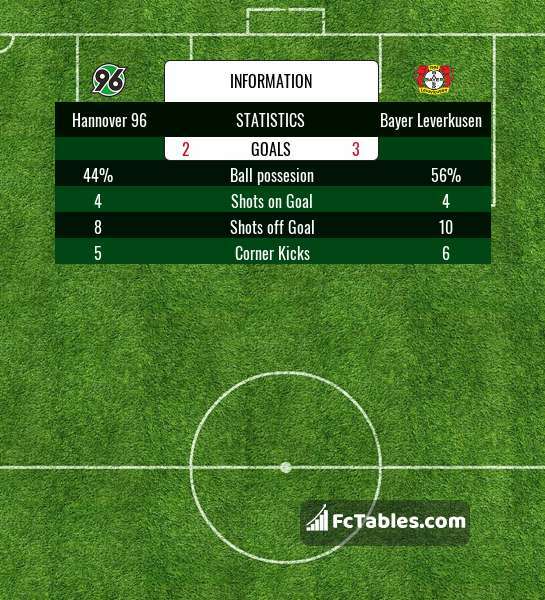 Hannover 96 scored average of 0.92 goals per game. In matches played at home 0.85 goals per game. In matches played at home an average of 2.69 goals (with opponent goals). For Bayer Leverkusen only in 1. Bundesliga the most goals scored: Kevin Volland 11 goals, Kai Havertz 10 goals. Team the most matches played with formation: 4-2-3-1. Bayer Leverkusen away won 6 matches, 2 draws and 5 defeits. Bayer Leverkusen scored average of 1.84 goals per game. In matches played away 2.00 goals per game. In matches played away an average of 3.62 goals (with opponent goals). Before the game team Hannover 96 in table was 17, Bayer Leverkusen was: 6. The match ended with the result 2:3. For Fortuna Duesseldorf only in 1. Bundesliga the most goals scored: Dodi Lukebakio 8 goals, Benito Raman 6 goals. Team the most matches played with formation: 4-1-4-1. Fortuna Duesseldorf at home won 6 matches, 0 draws and 7 defeits. Fortuna Duesseldorf scored average of 1.24 goals per game. In matches played at home 1.31 goals per game. In matches played at home an average of 2.92 goals (with opponent goals). For Eintracht Frankfurt only in 1. Bundesliga the most goals scored: Luka Jovic 15 goals, Sebastien Haller 14 goals. Team the most matches played with formation: 3-4-1-2. 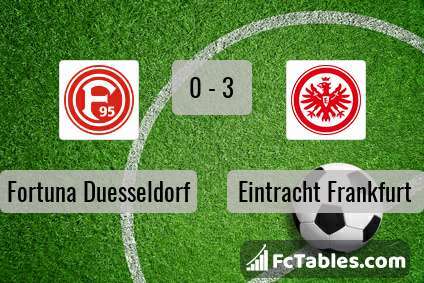 Eintracht Frankfurt away won 6 matches, 4 draws and 3 defeits. 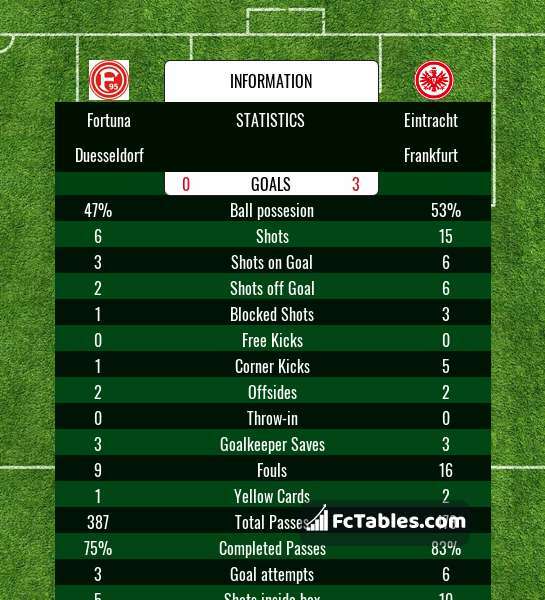 Eintracht Frankfurt scored average of 2.00 goals per game. In matches played away 1.77 goals per game. In matches played away an average of 2.85 goals (with opponent goals). 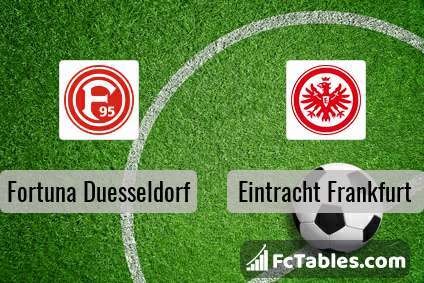 Before the game team Fortuna Duesseldorf in table was 11, Eintracht Frankfurt was: 5. The match ended with the result 0:3.